LDS claim that the true church must be built upon the foundation of apostles and prophets. 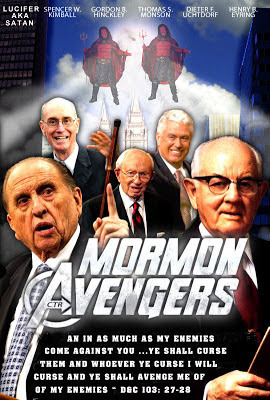 But, the LDS church did not have twelve apostles until five years after their church was organized! Do builders build a building for five years before laying the foundation? The LDS began ordaining their first twelve apostles on February 14, 1835 (D.H.C. Vol. II, pp. 180-200). The "three witnesses" of the B. of M. (who later apostatized) were elders and high priests in the LDS Church when they ordained the "twelve" to the higher office of "apostle." Mormons today cannot ordain someone to a higher office than what they themselves hold. The three witnesses of the B. of M. conferred the office of apostle on the twelve by "the laying on of hands" as they prayed prophetic prayers over each man separately. The apostleship they conferred is just as valid as their prophetic prayers given as they ordained the first LDS apostles. The following are some of those prophecies recorded in the D.H.C., Vol. II, pp. 188-191. . . .
(1}..... Lyman E. Johnson: "no power of the enemy shall prevent him from going forth and doing the work of the Lord and that he shall live until the gathering is accomplished... and he shall be like unto Enoch; ...Satan shall tremble before him and he shall see the Savior come and stand upon the earth with power and great glory." But, three years later, he apostatized and "was cut off (excommunicated) from the church" (D.H.C., Vol. III, p. 20). Furthermore, the "gathering" to Missouri (D.&C. 84:1-5), still has not taken place, and he was not like Enoch who never died (Gen. 5:24), because Johnson died in 1856 (Deseret News Church Almanac, 1989-1990, p. 49). . . .
(2)..... Heber C. Kimball: "many millions may be converted by his instrumentality; that angels may waft him from place to place, and that he may stand unto the coming of our Lord." But, there weren't even 85,000 Mormons when "Pres. Heber C. Kimball, first counselor to Pres. Brigham Young, died in Salt Lake City, June 22, 1868" (Essentials in Church History, p. 540). The LDS Church finally reached 1,000,000 members in 1947 which was 79 years after Kimball died. There is no record of angels "wafting" Kimball anywhere even once, and the Lord did not come before Kimball died! (3)..... Orson Hyde: "he 'may' (original Millennial Star, Vol. 15, p. 206 says 'shall') stand on the earth and bring souls till Christ comes... And may he be (original: 'he shall be') like one of the three Nephites." The three Nephites did not die, according to B. of M. III Nephi 28, but Orson Hyde died on November 28, 1878, in Spring City, Utah (Church Chronology by Andrew Jensen, p. 103). Thus, Hyde did not stand on the earth till Christ came. . . .
(4)..... David W. Patten: "May he continue till the Lord comes." But he was shot and killed on October 25, 1838 (D.H.C., Vol. III, pp. 170-171). So, he did not continue till the Lord came. . . .
(5)..... Luke S. Johnson: "The nations shall tremble before him... He shall bear testimony to the kings of the earth... The Ancient of Days shall pronounce this blessing, that he has been faithful and [he shall] speak all their tongues where he shall go." But, Joseph Smith recorded, "I returned to Kirtland on or about the tenth of December (1837). During my absence in Missouri, Warren Parrish, John F. Boynton, Luke S. Johnson, Joseph Coe and some others united together for the overthrow of the church. Soon after my return this dissenting band openly and publicly renounced the Church of Jesus Christ of Latter-day Saints (D.H.C., Vol. II, p. 528). If the prophecy was true, Luke Johnson was "faithful" when he renounced the LDS Church! There is no record of any nation trembling before him or of him bearing testimony to the kings of the earth or speaking many foreign languages. . . .
(6)..... William E. M'Lellin: "He may be spared until the Saints are gathered; ... the tempter shall not overcome him... his days may be prolonged until the coming of the Son of Man." But M'Lellin died April 24, 1883 (Deseret News Church Almanac 1995-1996, p. 51), and the Saints still haven't gathered (to Missouri) more than 100 years after his death. Thus, his days were not prolonged until the Son of Man came. It also sounds like the tempter overcame him because Joseph Smith said, "William E. M'Lellin was finally excommunicated from the church at Far West. Thence forward he took an active part in the persecution of the Saints in Missouri" (D.H.C., Vol. III, pp. 31-32). . . .
(7)..... John F. Boynton: "Thou shalt overcome all evils that are in the world... and in the flesh." But, Boynton was excommunicated from the LDS Church just two and a half years after this prophecy, in the fall of 1837 (Deseret New Church Almanac, 1995-1996, p. 51) See Luke S. Johnson prophecy (#5) for more about Boynton. Why did the LDS Church excommunicate Boynton if he overcame all evils in the world? . . .
(8)..... William Smith: "He shall be preserved and remain on earth until Christ shall come to take vengeance on the wicked." But he was excommunicated on October 19, 1845. He died November 13, 1893, at the age of 82 (Deseret News Church Almanac, 1995-1996, p. 51). The Lord still has not come to take vengeance on the wicked. . . . It does not take a theologian to see that all these are false prophecies. Heber C. Kimball said, "after we had been ordained by these brethren (the three witnesses), the First Presidency (including Joseph Smith) laid their hands on us and confirmed these blessings and ordinations, and likewise predicted many things which should come to pass" (Times and Seasons, Vol. VI, p. 868). . . .
. . . (9).... Some historians view Pratt's death as simply the act of a jealous husband who was deeply angered by a man who had "run off" with his wife .A 2008 Provo Daily Herald newspaper article characterized McLean as a man who had "hunted down" Pratt in retribution for "ruining his marriage. A 2008 Deseret News article described McLean as a man who had "pursued Pratt across Missouri, Oklahoma and Arkansas, angry that his estranged wife, Eleanor, had become Pratt's 12th wife." But many Mormons viewed Pratt's death as a martyrdom, a view first expressed in Pratt's dying words. But according to LDS church records, his dying words were not recorded until 38 years after his death. In the present day, Pratt's defenders still characterize the circumstances of Pratt's death as religious martyrdom. For example, a 2007 article in the Deseret Morning News stated that "Pratt was killed near Van Buren, Ark., in May 1857, by a small Arkansas band antagonistic toward his teachings". Historian Will Bagley reports that McLean and two friends tracked Pratt after he was secretly released by Van Buren's magistrate. Brigham Young compared Pratt's death with those of Joseph and Hyrum Smith, and many Mormons blamed the death on the state of Arkansas, or its people. . . . Due to his personal popularity and his position in the Council of the Twelve, Pratt's murder in Arkansas was a significant blow to the Latter-day Saint community in the Rocky Mountains, when they began hearing about it in June 1857. The violent death of Pratt may also have played a part in events leading up to the Mountain Meadows massacre a few months later. This massacre resulted in the deaths of 120 people from the Baker–Fancher party travelling to Southern California along the Mormon Road (a portion of the Old Spanish Trail. Jesus said it’s wrong to Marrying a divorced woman, both Joseph Smith Jr and Parley Pratt married women not even divorced. Both were killed . . .
Matthew 5 31 Furthermore it has been said, 'Whoever divorces his wife, let him give her a certificate of divorce. 32 "But I say to you that whoever divorces his wife for any reason except sexual immorality (FORNICATION) causes her to commit adultery; and whoever marries a woman who is divorced commits adultery. Matthew 19 8 He said to them, "Moses, because of the hardness of your hearts, permitted you to divorce your wives, but from the beginning it was not so. 9 "And I say to you, whoever divorces his wife, except for sexual immorality (FORNICATION), and marries another, commits adultery; and whoever marries her who is divorced commits adultery." . . .
Orson Pratt However, Pratt's views were not always without controversy. In 1865, a majority of the First Presidency and the Quorum of the Twelve Apostles of the LDS Church officially condemned some of Pratt's doctrinal writings, including some of his articles from The Seer: "The Seer [and other writings by Pratt] contain doctrines which we cannot sanction, and which we have felt impressed to disown, so that the Saints who now live, and who may live hereafter, may not be misled by our silence, or be left to misinterpret it. Where these objectionable works, or parts of works, are bound in volumes, or otherwise, they should be cut out and destroyed."